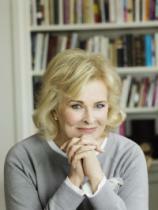 Candice Bergen’s film credits include The Sand Pebbles, Carnal Knowledge, Starting Over (for which she received an Oscar nomination) and Miss Congeniality. On television, she made headlines as the tough-talking broadcast journalist and star of "Murphy Brown," for which she won five Emmys and two Golden Globes. She later starred with James Spader and William Shatner in the critically acclaimed series "Boston Legal." A FINE ROMANCE begins with Candice Bergen’s charming first husband, French director Louis Malle, whose huge appetite for life broadened her horizons and whose occasional darkness never diminished their love for each other. But her real romance begins when she discovers overpowering love for her daughter after years of ambivalence about motherhood. As Chloe grows up, Bergen finds her comic genius in the biggest TV role of the '80s, "Murphy Brown," and makes unwanted headlines when Dan Quayle pulls her into the 1992 presidential campaign.